Four stories five CD set. Approximately six hours of spoken word by Buckwheat with music. 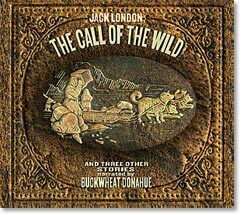 Includes short bios of Jack London and Buckwheat Donahue. Features: Call of the Wild (discs one to three), To Build a Fire (disc four), That Spot (disc four), Love of Life (disc five). Feel the granduer of the Arctic North, the terrifying grip of bitter cold, and the profound will to survive as Buckwheat interprets these Jack London classics. Attractice book style packaging, narrated by Buckwheat Donahue. Guitars: Electric, Acoustic, 12-string and Baitone: Scott Bennett. Mandolin, Banjo, Dobro: Ernie Martinez. Pedal Steel: Daniel Jones. Fllute and Character Voice: Ted Cole. Synthesizer: Jim Ratts. Piano: Dave Bourne. Character Voices: Timothy P. Irvin. Robert Service was born in England in 1874. After spending his childhood in Scotland, he went to Canada and commenced the life of wandering and adventure which has given birth to songs, rhymes, ballads and poems that have spread over the entire world. Mr. Service, who escaped to America from the German invasion of France, later returned to that country where he spent the remainder of his days. In his poetry however, he still lives as a vagabond in the hearts of his many readers. 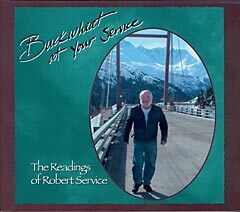 Robert Service has caught the spirit of wanderlust latent in every one of us and his verses will live on forever. I wanted the gold, and I sought it; I scrabbled and mucked like a slave. Was it famine or scurvy, I fought it; I hurled my youth into a grave. I wanted the gold, and I got it -- Came out with a fortune last fall, -- Yet somehow life's not what I thought it, And somehow the gold isn't all. Includes: The Cremation of Sam McGee, The Shooting of Dan McGrew, The Pines, North To Alaska, The Spell Of The Yukon, Bessie's Boil, The Harpy, My Madonna, Maternity, The Law Of The Yukon, The Ballad Of Casey's Billy-Goat, The Ballad Of Blasphemous Bill, The Men That Don't Fit In, and Arctic Wind.